Above: A publicity portrait of Frank Lackteen as the titular villain in the silent serial Hawk of the Hills (Pathe, 1927). Gaunt and grim, with a beak-like nose and piercing eyes that made him look like a bird of prey, Frank Lackteen could convey crafty menace with a mere glare or a single dramatic gesture; his hoarse, guttural, and heavily-accented voice sometimes made his line delivery sound awkward, but also made his dialogue just as arrestingly sinister as his forceful movements and his baleful appearance. 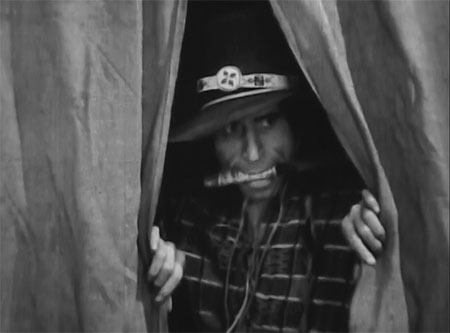 Lackteen was one of the most prominent villains of the silent serial era, but found major parts in sound chapterplays much harder to come by, due to his aforementioned accent. However, he still played many small parts and several larger ones in the serials of the 1930s, 1940s, and 1950s–and invariably made both his major and minor chapterplay characters quite memorable. Lackteen played many villainous and non-villainous bit parts–and a few major ones–in serials and features during the first half of the 1930s. The part-silent, part-sound 1930 Universal chapterplay The Jade Box (now lost) featured him as a member of a threatening but ultimately benign group of Eastern cultists; his first real sound-serial role, however, came in Heroes of the West (Universal, 1932). He was cast here as a mercenary half-Indian outlaw named Buckskin Joe, who assisted a crooked contractor (Philo McCullough) in a sabotage campaign against a frontier railroad project. Though he had less screen time than either McCullough or chief henchman Harry Tenbrook, Lackteen handled his part with aplomb; he managed to make Buckskin seem both shifty and tough, and did a good job of emphasizing the character’s practical and disinterested attitude towards his cohorts’ schemes–particularly when pointedly inquiring as to his cut of the profits spoils, or offering sarcastic and laconic comments on the villains’ failures. 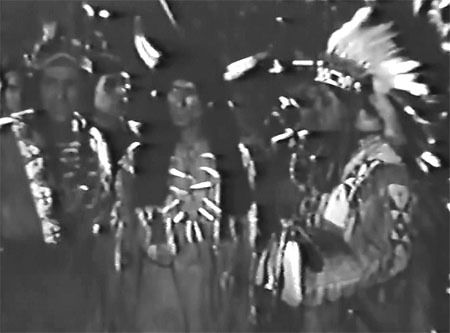 Lackteen would return to Indian-villain mold many more times during his sound serial career; his accent was undefinable enough to pass for an Apache or Sioux inflection–and such parts allowed producers to make use of his talents without raising international issues that could have roused censors’ ire. 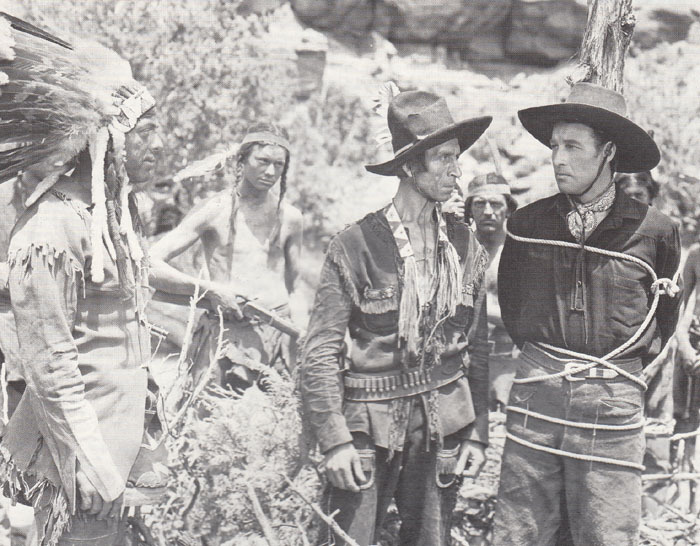 Above: Frank Lackteen and Harry Tenbrook in Heroes of the West (Universal, 1932). 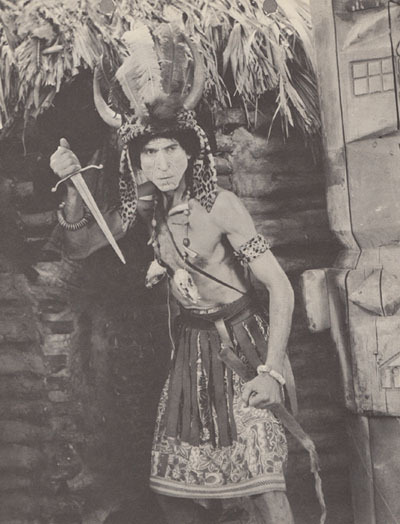 Lackteen played an atypically non-villainous role in his next serial, The Jungle Mystery (Universal, 1932)–a trusty Arab guide named Kazimoto, who helped heroes Tom Tyler and Noah Beery Jr. in their search for a priceless treasure of ivory. Unfortunately, Jungle Mystery is one of many early 1930s Universal serials that has been unavailable since its original release–depriving serial-goers of one of Lackteen’s only major sympathetic characterizations. The Last Frontier (RKO, 1932) gave Lackteen a more characteristically sinister part as a stern Indian chief named Pawnee Blood; his main function here was to stand in front of a teepee, grimly trade for guns with the villains, and provide a visual bridge to stock footage from a big-budget 1926 feature also called The Last Frontier–in which Lackteen had played an Indian leader; numerous scenes of the 1926 Lackteen rallying his tribesmen and leading them in battle were interpolated directly into the 1932 serial. 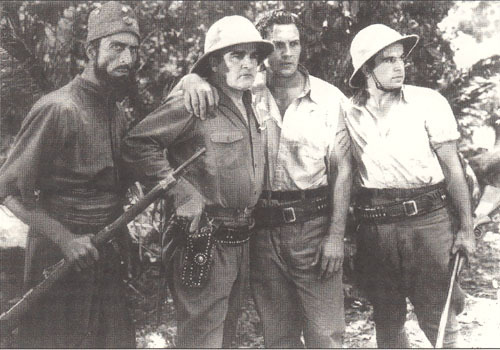 Above, left to right: Frank Lackteen, William Desmond, Tom Tyler, and Noah Beery Jr. in The Jungle Mystery (Universal, 1932). Image courtesy of Ed Hulse (see acknowledgements). 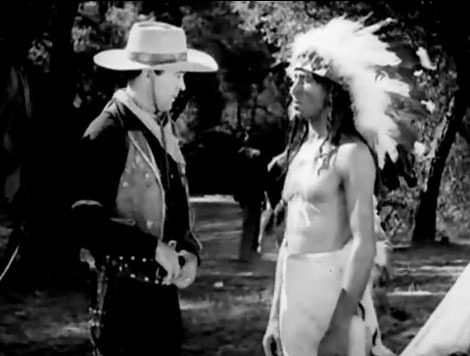 Above: Frank Lackteen pow-wows with LeRoy Mason in The Last Frontier (RKO, 1932). 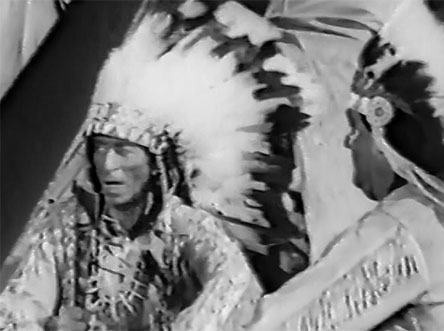 Clancy of the Mounted (Universal, 1933) featured Lackteen as yet another renegade Indian–Wolf Fang by name. Until recently, Clancy was another of Universal’s lost serials; the first six chapters finally became available to collectors in 2012, but the second half of the serial remains in limbo. 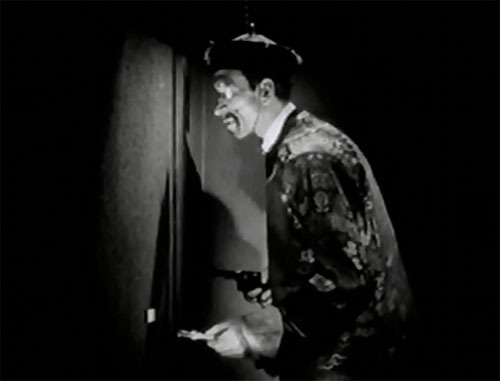 Lackteen didn’t appear in the serial until Chapter Six, when hero Tom Tyler sought him for questioning in a gun-running investigation, and apparently got knifed by him for in the episode’s cliffhanger scene; due to the incomplete state of the serial, there’s unfortunately no way of knowing whether Lackteen’s character maintained a prominent presence in Clancy after this halftime entrance. His next serial, Tarzan the Fearless (Sol Lesser Productions, 1933) featured him in its first three chapters as a treacherous head porter named Abdul, who hung around in the background cracking his whip at unfortunate native bearers, until, assisted by his wife (Symona Boniface) he kidnapped the leading lady (Jacqueline Wells) and sold her to Arab slavers, necessitating a rescue by Tarzan (Buster Crabbe). Abdul dropped out of sight after Tarzan and the girl escaped the Arab camp at the beginning of the fourth episode. Above: Frank Lackteen lies in wait for Tom Tyler in Clancy of the Mounted (Universal, 1933). The Perils of Pauline (Universal, 1933) cast Lackteen as Fang, the chief henchman of Eurasian master criminal Dr. Bashan (John Davidson)–who helped his master trail Pauline (Evalyn Knapp) and her archeologist father (James Durkin) as they traveled the world in search of an ancient dissolving-gas formula. Lackteen lurked in shadows and peered round corners to nicely ominous effect in Pauline, but was–unfortunately–rarely given the opportunity to do anything actively villainous, and spent most of his screen time merely spying on the good guys. Lackteen’s menace was also undercut by his character’s grovelingly obsequious attitude towards his overbearing master; Fang was repeatedly berated for his failures by Bashan, and received the angry reproaches far more meekly than most of Lackteen’s other serial heavies would have. Fang took an accidental and pyrrhic revenge on Bashan in the final chapter, however–clumsily and unintentionally releasing the dissolving gas that killed both himself and his boss. 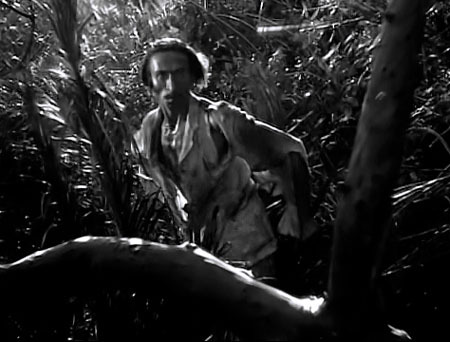 Above: The long-suffering Frank Lackteen staggers through the jungle after narrowly surviving leopard and crocodile attacks in The Perils of Pauline (Universal, 1933). Above: Frank Lackteen waits on John Davidson in Perils of Pauline. Lackteen spent most of the next four years playing bits and character parts in features that ranged from the big-budget Foreign Legion film Under Two Flags to the Gene Autry B-western Comin’ Round the Mountain; he didn’t return to the serial genre until 1937, when he played a major role in Universal’s Radio Patrol. This colorful and fast-moving outing gave Lackteen his meatiest sound-serial role yet; he was cast as the leader of one of the serial’s two principal villainous factions–an unscrupulous Iranian ambassador named Tahata, who vied with another gang of heavies for control of a priceless flexible steel formula throughout the chapterplay. To satisfy the Production Code, Tahata was revealed in the final chapter to be a hypnotist named Werner–who had assumed the identity of the real Tahata in order to further the schemes of a villainous American tycoon; however, this slightly silly twist did no appreciable damage to Lackteen’s memorably villainous performance. He commanded the audience’s attention in all of his scenes, whether he was suavely and aloofly deflecting the suspicions of policeman hero Grant Withers, fanatically declaiming about his country’s need for flexible steel, or eerily asserting his hypnotic control over his chief henchman (Leonard Lord). 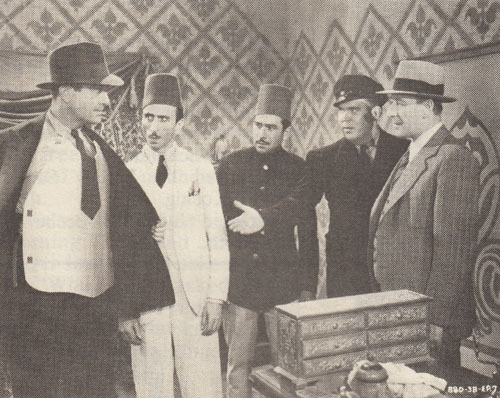 Above: Frank Lackteen questions Max Hoffman Jr. (second from right) in Radio Patrol (Universal, 1937). 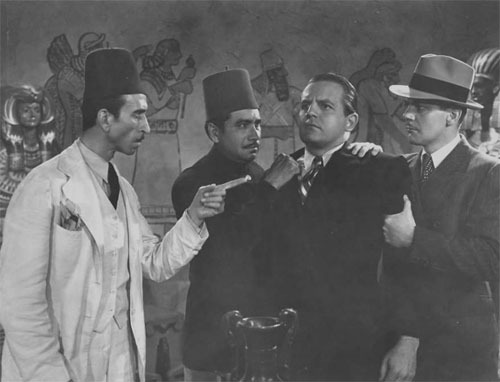 Richard Botiller (in fez) and Leonard Lord (in fedora) are holding Hoffman. Above: Grant Withers (far left) shows disappointed villains Frank Lackteen, Richard Botiller, and Gordon Hart (far right) the bullet-proof vest that has just saved him from an attempted shooting in Radio Patrol. Adrian Morris, as Withers’ fellow-cop, is much more pleased with the hero’s survival. Lackteen’s next serial was The Mysterious Pilot (Columbia, 1937), a mystery/chase tale set in Canada and starring real-life aviator Frank Hawks. Pilot was directed by Spencer Gordon Bennet, who had helmed many of Lackteen’s Pathe outings–and who assigned Lackteen to a part almost as substantial as those he had enjoyed in some of those outings. Kenneth Harlan played the principal villain of Pilot–a crooked politician determined to track down the heroine (Dorothy Sebastian) in order to keep her from testifying against him in a murder case; Lackteen, as a backwoods “half-breed” named Yoroslaf, served as one of Harlan’s chief agents in this relentless pursuit. Though his character’s Russian name didn’t match the French-Canadian “m’sieurs” repeatedly dropped into his dialogue (the writers were probably trying to keep the villain’s ethnicity vague), Lackteen’s role in Pilot gave him excellent scope for villainy; Yoroslaf was far less self-controlled and much more violent than the other serial heavies he had portrayed during the 1930s, and Lackteen played this belligerency for all it was worth–aggressively quarrelling with his colleagues, ferociously knifing Mounties, shouting threats at a courageous Indian (Yakima Canutt) when the latter refused to give him information under torture, and otherwise behaving in an extremely bad-tempered fashion that, coupled with his foreboding appearance, made him seem genuinely frightening. 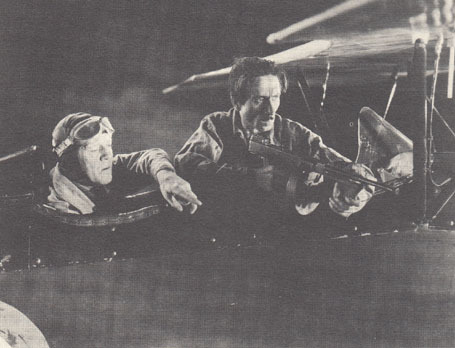 Above: Tom London and Frank Lackteen prepare for aerial action in The Mysterious Pilot (Columbia, 1937). Above: Bob Terry tries to fight off Frank Lackteen in The Mysterious Pilot. Columbia’s next serial release, The Secret of Treasure Island (1938) gave Lackteen a small non-villainous role as a taciturn Mexican bartender named Pedro, who provided a temporary haven for the hero and heroine (Don Terry and Gwen Gaze) after their escape from the titular island and its evil ruler (Walter Miller). The Great Adventures of Wild Bill Hickok (also 1938) was Lackteen’s third consecutive Columbia serial; here, he appeared in two chapters as a half-breed outlaw called the “Vulture,” who was hired by the heavies to kill Hickok (Bill Elliott) but was prevented from burning him at the stake when Hickok used a convenient eclipse to scare the Vulture’s superstitious Indian cohorts. Small though this part was, it allowed Lackteen some nicely sly and malevolent moments; he got to astutely haggle with chief villain Robert Fiske over the price of his attack on Hickok, as well as gloat with considerable relish as he prepared to set the hero afire. 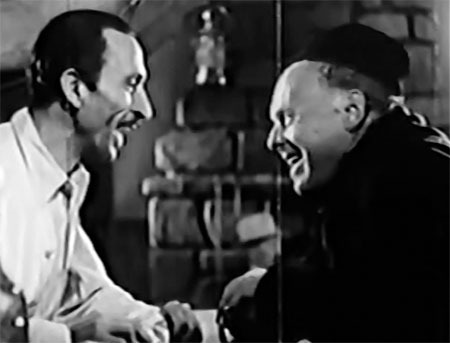 Above: Frank Lackteen cracks a rare grin as he greets old salt Captain Cuttle (George Rosener) in The Secret of Treasure Island (Columbia, 1938). Above: Frank Lackteen gets ready to burn Bill Elliott at the stake in The Great Adventures of Wild Bill Hickok (Columbia, 1938). 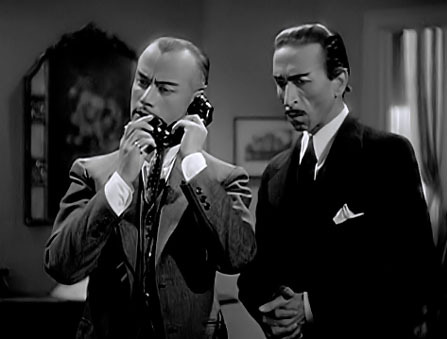 Red Barry (Universal, 1938) gave Lackteen what at first promised to be one of his best 1930s parts; as a cunning Chinatown gang lord named Quong Lee, he figured prominently in the 13-chapter serial’s first seven episodes–cagily fencing with dedicated Chinese agents, a group of Russian exiles, and American police detective Red Barry (Buster Crabbe) as he attempted to seize a fortune in stolen bonds. Lackteen’s coolly confident, dryly sarcastic, and unabashedly evil characterization contrasted admirably with the impetuosity, heroism and reluctant criminality of his various opponents, and provided the serial with a strong central villain; however, he was disappointingly written out of the serial halfway through, when the writers revealed that “Quong Lee” was merely a second identity assumed by a shady theater manager named Mannix (William Ruhl). A Chapter Eight shot of Lackteen removing makeup segued into a shot of Ruhl finishing the makeup removal–after which Lackteen disappeared from Barry, leaving the bland Ruhl to handle the chapterplay’s villainy in much less colorful fashion. This frustrating left turn in the plot smacked of belated scripting interference by producers nervous about depicting a Chinese heavy–and was decidedly deleterious to Barry; the serial’s Lackteen-deprived second half was definitely less interesting than its first half. 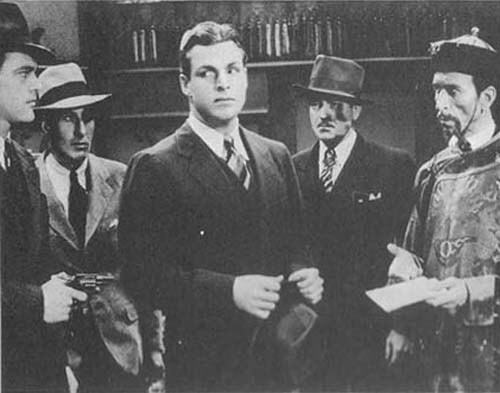 Above, left to right: Tom Steele, James Sheridan, Buster Crabbe, Wheeler Oakman, and Frank Lackteen in Red Barry (Universal, 1938). Above: An eerily underlit Frank Lackteen threatens the off-camera Buster Crabbe from concealment in Red Barry. Lackteen took another hiatus from serial-making after Barry, playing small parts in Western features (both A and B titles) and historical epics (like Warner Brothers’ The Sea Hawk) for the next few years. In 1941, he landed another chapterplay part in Republic Pictures’ excellent Jungle Girl, and turned in the best-remembered performance of his sound-era serial career. He was cast as Shamba, the witch doctor and would-be leader of an isolated native tribe called the Masumbas; in hopes of acquiring a tribal medallion that would give him the authority he sought, he joined forces with diamond-seeking criminals from the outer world, and did his best to eliminate heroine Nyoka Meredith (Frances Gifford)–the daughter of a murdered jungle doctor, and the chief obstacle to his and his associates’ plans. Although he shared villainous duties with two other top-notch screen heavies (Gerald Mohr and Trevor Bardette), Lackteen emerged as Jungle Girl’s most memorable villain–using gestures and facial expressions more than dialogue to convey craftiness (while bargaining with his partners in crime), bitter hatred (for Nyoka and her father), sinister exultation (whenever he seemed about to succeed in killing the heroine), and an assured sense of his own power (when conducting voodoo rituals or ordering his native henchmen around). He also managed to seem quite unselfconscious and even rather imposing in Shamba’s witch-doctor face paint and horned headdress, instead of merely ridiculous–a feat few other serial actors could have pulled off. 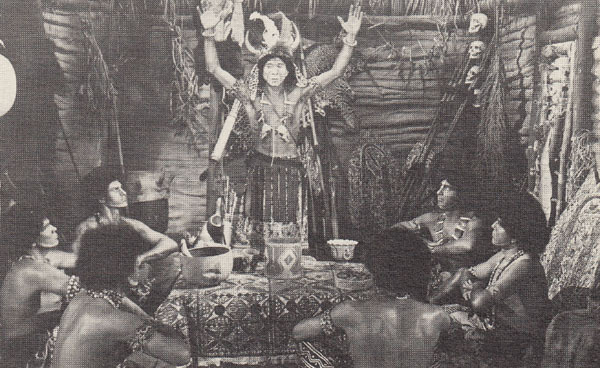 Above: Frank Lackteen presides over a voodoo ceremony in Jungle Girl (Republic, 1941). Above: Tom Neal unties Frances Gifford, unaware that Frank Lackteen is preparing to puncture him in Jungle Girl. Above: John Litel watches as Frank Lackteen tests a microphone connected to an idol in Don Winslow of the Navy (Universal, 1941). Lackteen spent most of the remaining years of the 1940s playing uncredited character bits in features, only occasionally returning to serial-making; he took his biggest post-Jungle-Girl chapterplay role in The Desert Hawk (Columbia, 1944), a first-rate Arabian Nights swashbuckler. 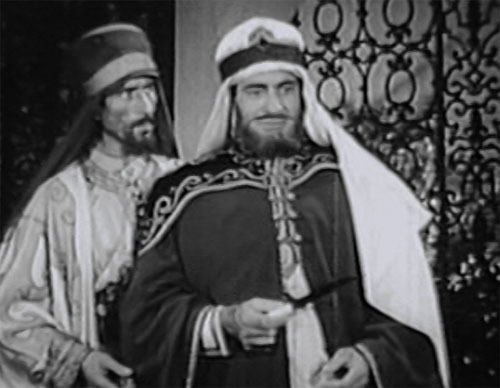 As Faud, the treacherous chamberlain of the just and noble Caliph Kasim (Gilbert Roland), Lackteen set the serial’s plot rolling by helping Kasim’s evil twin brother Hassan (also Gilbert Roland) secretly take over Kasim’s identity and throne; Hassan made Faud his Grand Vizier as a reward for this piece of treason–but Kasim survived a botched assassination to fight against his usurping brother’s tyranny. Faud provided Hassan with shrewd counsel in the ensuing battle with Kasim, but the relationship between the two villains became increasingly strained as Faud kept trying to rein in Hassan’s arrogance and impetuousness, which continually threatened to give their whole plan away; Hassan finally stabbed Faud in Chapter Fourteen, after the Vizier made one too many objections to his plans. Lackteen, whose Middle Eastern background suited him admirably to Hawk’s milieu, was excellent in this secondary villain role; his coldly intelligent manner played well off of Roland’s fieriness impatience during the heavies’ plotting sessions, while he also did a good job of registering growing nervousness as Hassan became more and more uncontrollable. 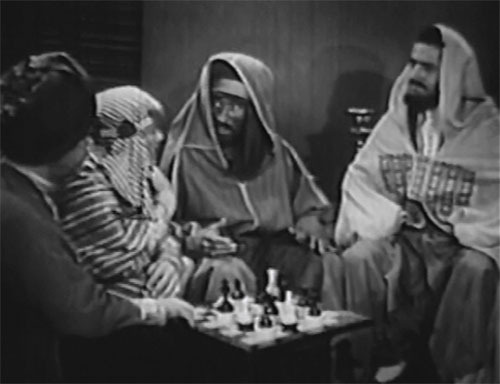 Above: Frank Lackteen (center) explains his plan for deposing the Caliph to (left to right) Wade Crosby, Reed Howes, and Gilbert Roland in The Desert Hawk (Columbia, 1944). Above: Gilbert Roland’s Hassan has just carelessly murdered a man who recognized him as an impostor, much to the chagrin of Frank Lackteen’s more prudent Faud in The Desert Hawk. The Scarlet Horseman (Universal, 1946), featured Lackteen briefly in its first chapter as a renegade Comanche who was fatally shot by his badman associates after refusing to help steal a sword sacred to his tribe; he survived long enough to impart a vital bit of information to hero Peter Cookson before dying. Lost City of the Jungle (also Universal, 1946), gave Lackteen a small recurring role as an unkempt, helpful, and extraordinarily well-informed blind beggar, who periodically gave valuable tips to heroes Russell Hayden and Keye Luke. 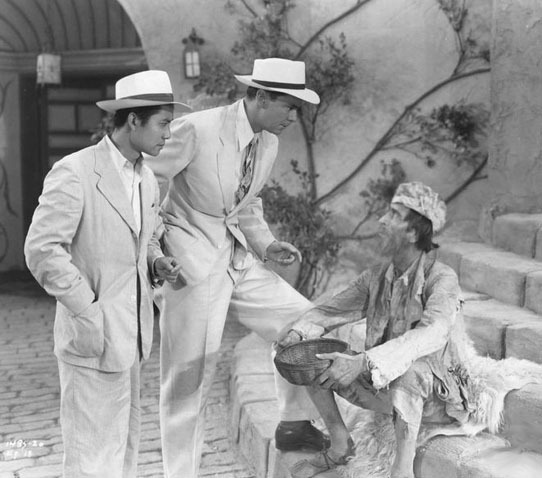 Above: Keye Luke (far left) and Russell Hayden get information from Frank Lackteen in Lost City of the Jungle (Universal, 1946). 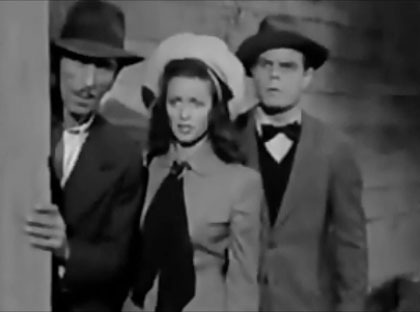 The Black Widow (Republic, 1947) gave Lackteen a colorful cameo as an honest but slightly eccentric tobacconist named A. Kabob, who was allergic to tobacco but could identify a brand just by smelling it–and did so, incurring a sneeze to help hero Bruce Edwards trace a suspect through a cigarette; Lackteen’s deadpan handling of this unusual bit was quite funny. He was an informant again–albeit a less respectable one–in the 1948 Columbia serial Superman (Columbia, 1948); as a seedy “stool pigeon” with the highly unlikely name of Hawkins, he sporadically popped in and out of alleys to sell information to scoop-seeking reporter Lois Lane (Noel Neill), playing his character with a good combination of furtiveness and poker-faced self-assurance. 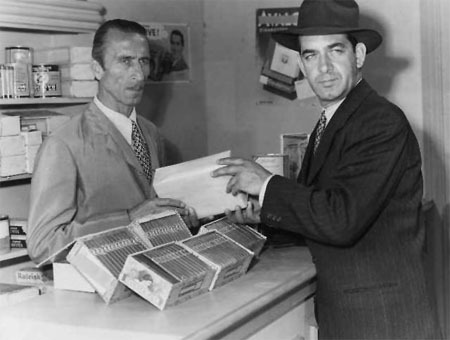 Above: Anthony Warde buys tobacco from Frank Lackteen in The Black Widow (Republic, 1947). Above: Frank Lackteen, Noel Neill, and Tommy Bond (as Jimmy Olsen) in Superman (Columbia, 1948). 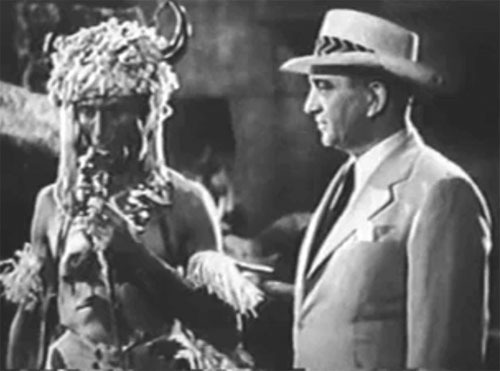 Lackteen donned a horned witch-doctor headpiece once again in Congo Bill (Columbia, 1948)–this time to play Nagu, the double-dealing medicine man of a lost tribe ruled by a white queen named Lureen (Cleo Moore), who was actually a long-lost heiress. Lackteen’s role here was smaller than in Jungle Girl but bigger than in Don Winslow of the Navy; as in those chapterplays, his witch doctor hoped to assume the rule of his tribe, and plotted with outside villains (in this case, gold smugglers led by Leonard Penn) to further his ends–clashing with Lureen and with the exploreer (Don McGuire) hired to return her to civilization in the process. The gold smugglers, a shady trading-post proprietor (Charles King), and a greedy circus owner (I. Stanford Jolley) bent on seizing Lureen’s inheritance received more footage in Bill than Lackteen did, but he displayed all of his old menace whenever he appeared on screen–following his queen’s commands with a perfect combination of hypocritical deference and angry resentment, and supervising ambushes or tribal executions with an air of grim satisfaction. Above: Frank Lackteen smiles evilly, in the mistaken belief that Cleo Moore has suddenly decided to allow him to execute the off-camera Don McGuire in Congo Bill (Columbia, 1948). Lackteen kept acting during the 1950s, guesting on several early television shows (Hopalong Cassidy, Dangerous Assignment, and others) while continuing to work as a minor character player in features. In 1956, he made a brief return to the chapterplay genre, appearing in Perils of the Wilderness and Blazing the Overland Trail (both Columbia, 1956). 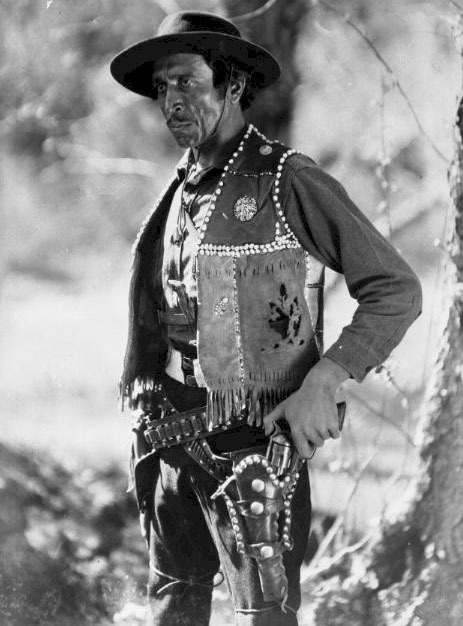 In Perils, he played the medicine man of a Canadian Indian tribe, who (in classic Lackteen tradition) was plotting with outlaws against his own chief; his character only had a few scenes, but took part in tribal arguments, a shootout, and a brawl before getting shot by his chief’s son. Lackteen also played a second role in Wilderness–a non-speaking bit as a henchman who tried to knife the hero but was subdued in a fistfight; this fight footage was culled entirely from The Mysterious Pilot, with Lackteen wearing his Pilot costume in the Perils footage in order to link the old and new scenes together. Above, left to right (foreground): Rick Vallin, Frank Lackteen, and Robert Bice in Perils of the Wilderness (Columbia, 1956). 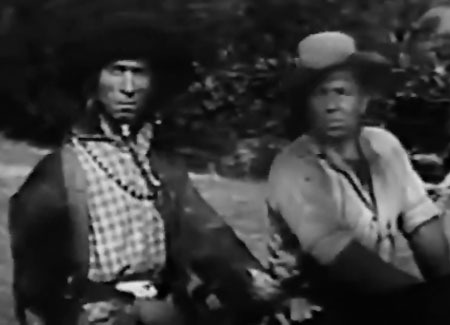 Blazing the Overland Trail, the last American theatrical serial ever made, gave Lackteen a series of brief appearances as an Indian chief named War Eagle, who periodically led his followers into battle against the heroes at the villains’ behest. Small as Lackteen’s part was, it lent a nice touch to Trail; given his forty-year connection with the serial career, it was highly appropriate for him to be on hand to help ring down the chapterplay’s final curtain. 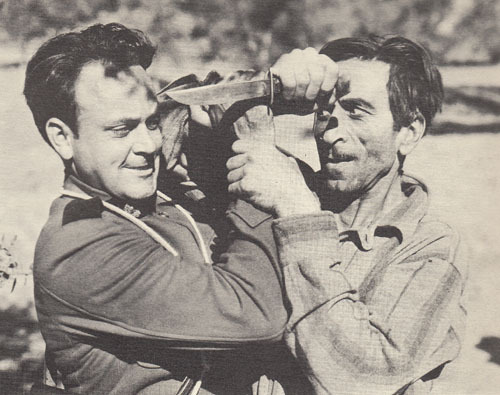 Above: Frank Lackteen waves the war-hatchet in Blazing the Overland Trail (Columbia, 1956). Lackteen continued appearing on TV and in features (including Cecil B. DeMille’s The Ten Commandments) during the second half of the 1950s, retiring in 1960 after playing a small but pivotal part (an Eastern ruler targeted for assassination) in the 1960 B-thriller Three Came to Kill. He briefly emerged from retirement in 1965, joining John Mack Brown, Edmund Cobb, and many other serial and B-western actors to play credited cameo roles in the Western features Requiem for a Gunfighter and The Bounty Killer–both produced by nostalgia buff Alex Gordon, and both directed by Lackteen’s old Pathe colleague, Spencer Gordon Bennet. After this final bow, Lackteen returned to retired life, passing away in Hollywood’s Woodland Hills suburb three years later. Although Frank Lackteen never recaptured his silent-serial fame during the sound era, he still made his mark on talking chapterplays. His face, voice, and mannerisms gave him a unique screen presence that lent touches of color or menace (usually the latter) to each sound serial he appeared in–and helped him to command matinee audiences’ attention whenever a really sizable speaking role came his way. Above: A publicity still of Frank Lackteen as the sinister Shamba in Jungle Girl (Republic, 1941). Acknowledgements: My thanks to Chuck Anderson and his invaluable Old Corral; that site’s well-researched page on Lackteen provided all the biographical data that I used in compiling this article. My thanks also to Ed Hulse, editor of the magazine Blood ‘n’ Thunder, who kindly gave me permission to use a scan of the Jungle Mystery still featured in the Summer, 2006 issue of BnT. Ed’s website, Murania Press (with information on BnT and much more) can be found here. Great stuff. Wish I found you earlier.